This cabin design has been adapted for use as a boathouse. It features a 4' porch, two sets of 4' Full Panel Double Doors and a Dutch hip roof. Pricing does not include the customer-specified vertical fold up windows, ornate copper trim around the porch posts and extra overhang. 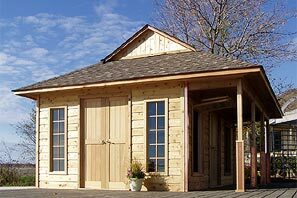 Our cabins are constructed with cedar or maintenance-free siding, and cedar doors, windows and trim. All our cabins, cottages and bunkies come standard with 1/2" plywood roof sheathing and 2x4 SPF framing. Click on the pictures in the filmstrip to view larger images of the pictures shown there. Use the models listed in the design center as a starting point for your cabin design. Use this design center to price and/or customize this cabin design. Use the different sizes shown below as a starting point. Watch our design center instructional video and find out how to design and get pricing for this cabin style in almost any size!